This project Canteen Management System is developed on VB.net and MySQL database. The main aim of this project Canteen management system is to provide fast services to their company employees by using their records which has been saved. This project Canteen management system is to manage all the details of Food, Items, Sales, Products,Canteen. It manages information about Food, Orders, Canteen, Food. In this system customers can easily check their account status, services which they have taken and bills which they paid and due amount details, if there is any for their account. 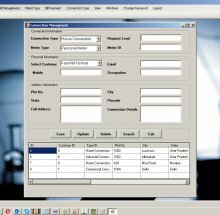 We have developed this project "Electricity Billing System" for managing all the operations of the Electricity Department by a computer software system. This projects has capable to perform all the operations needed by electricity department. This project has been developed using VB.Net Windows Application.